Milwaukee, like many cities, is working to upgrade and separate their complex sewer system. As part of the upgrade, a 4,500-foot section of an existing combined sewer was identified as needing rehabilitation. Milwaukee, the largest city in Wisconsin, has a population of approximately 600,000. The city lies along the shores of Lake Michigan, one of the five Great Lakes of North America and the only one located entirely within the United States. One third of Milwaukee’s sewer system is served by combined sewers that carry both wastewater and storm water. During heavy rain, the flow in combined sewers can reach capacity due to the inflow of rainwater that runs off of the streets as well as infiltration from leaking infrastructure. After rehabilitation, this line still operates as a combined sewer. The City of Milwaukee looks for strategic opportunities to separate the combined sewer system, especially when they are near a river. “In addition, we look for opportunities to install green infrastructure as part of paving and public works projects,” continued Thur. 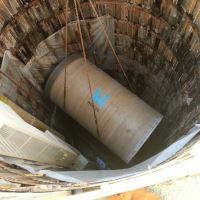 The existing 144-inch monolithic concrete sewer needed repair in order to restore both hydraulic capacity and structural integrity and to eliminate infiltration. It was sliplined with 126-inch centrifugally cast, fiberglass reinforced, polymer mortar (CCFRPM) pipe manufactured by Hobas Pipe USA. This is the first project in which Hobas Pipe USA custom manufactured pipe of this diameter and it was the largest fiberglass sliplining job done in North America up to that time. “We see a trend in the sewer market toward larger diameters and we are investing in our facility to ensure we meet the needs of our customers. Recent investments in our manufacturing plant and test facilities allow for future diameter growth,” said Kimberly Paggioli, P.E., vice president, marketing and quality control, Hobas Pipe USA. Sliplining is one of the oldest and most reliable methods for trenchless rehabilitation of existing pipelines. This installation method is used to repair leaks, restore structural stability, and increase hydraulic efficiency to an existing pipeline. It may be performed by slipping a pipe into the existing host from an access shaft, or can be completed by installing a smaller "carrier pipe" into a larger "host pipe" placing one at a time. Typically, the annular space between the two pipes is grouted and each manhole-to-manhole run is sealed. Sliplining allows for a limited surface footprint which is especially important in populated areas since it minimizes disruption of businesses, highways, railways, etc. On the North 26th Street project from West St. Paul to West McKinley Boulevard., the existing line was 144-inches in diameter and it was sliplined with nominal 126-inch diameter CCFRPM pipe. With an outside diameter of 132 inches, the clearance was only six inches radially at the pipe barrel. An important consideration in sliplining is the hydraulic requirements of the project. The capacity of a pipeline is modified due to sliplining and the effect will be dependent on the relative sizes of pipes and their respective hydraulic characteristics. Even though there was a reduction in diameter, the capacity of the line was not only maintained, but increased. A tool for evaluating a rehabilitated pipeline can be found here. The tool assumes that two pipes of different diameters are installed on the same grade in a gravity flow situation, which would be the case in most sliplining instances. To meet the structural requirements, the liner pipe was designed with a stiffness class of 46 psi and manufactured with low profile bell joints. The low profile bell-spigot joint consists of an integral straight bell fixed to one pipe end that seals to the spigot end of another pipe by compressing an elastomeric gasket contained in a groove on the spigot. This joint is intended for sliplining applications for non-pressure service and provides leak-free capability. Michels Tunneling of Brownsville, Wis. was the installation contractor for this project. A leader in the tunneling industry, Michels has installed CCFRPM on previous projects. “In addition to pricing, Michels selected to install Hobas because of an excellent past working relationship,” stated Russ Pollard, project manager, Michels Corporation. The pipe was carried in on rails one length at a time. “It was a live tunnel, the water was only about six to 12 inches deep,” stated Pollard. Michels used a tugger to pull the pipe through the tunnel and a skid steer to follow and assist in pushing, setting in place and final blocking. The pipe was installed in only four runs through two drop shafts and three manholes. The runs were 1,372 feet, 1,638 feet, 1,300 feet and 267 feet. “Due to the size of the pipe, it was little more cumbersome than smaller diameter pipe, but once we developed a safe procedure and system of installation, the install went smoothly,” explained Pollard. With the pipe installed, grouting was the next step. The line was grouted in three stages filling the annular space between the existing pipe and the new fiberglass pipe. Proper grouting of the annular space safeguards a long life for the pipeline as well as minimizing the possibility of subsidence as the original host pipe further deteriorates.